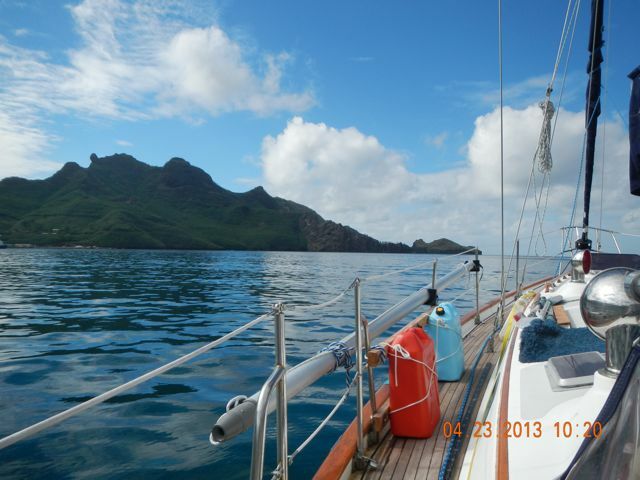 We arrived in Nuku Hiva, Marquesas, French Polynesia after 23.5 days at sea, crossing from Cabo San Lucas, Mexico. We were SO pleased to be on land and off watch! French Polynesia is a French territory, self ruling. 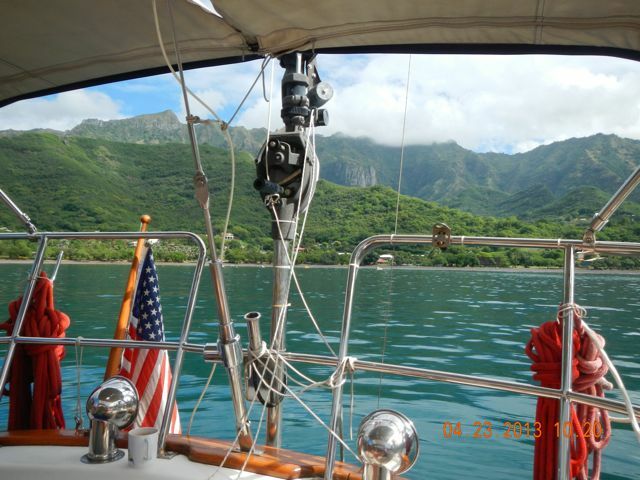 There are four archipelagos comprising French Polynesia: Society, Marquesas, Australes, Tuamotus. It looks much like it has for 50 years with horses still serving for transportation and people moving at slower paces than we do. Our first impression was the smell of rotting vegetation, like a greenhouse smell. Then came the flowers. Wow! We've NEVER smelled such a place. 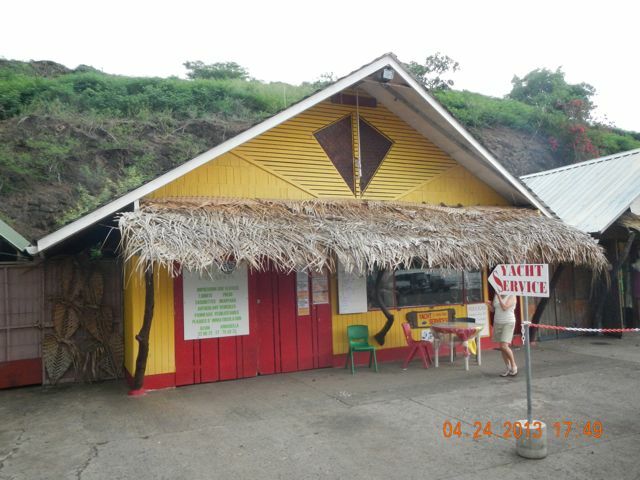 Taiohae is the main bay on the island. It's made in the caldera of an ancient volcano, the other half of the volcano (and island) having sloughed into the Pacific long ago. 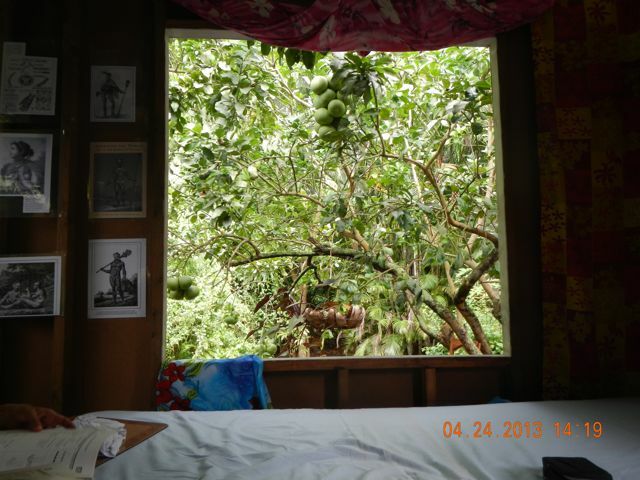 Every conceivable fruit and vegetable grows wild here: pineapple, coconuts, lime, starfruit, pamplemousse (similar to a grapefruit) avocado, cashew, coffee, orange, mango, chocolate, vanilla, taro, manioc, papaya, breadfruit, and everything in between, and most in several varieties. 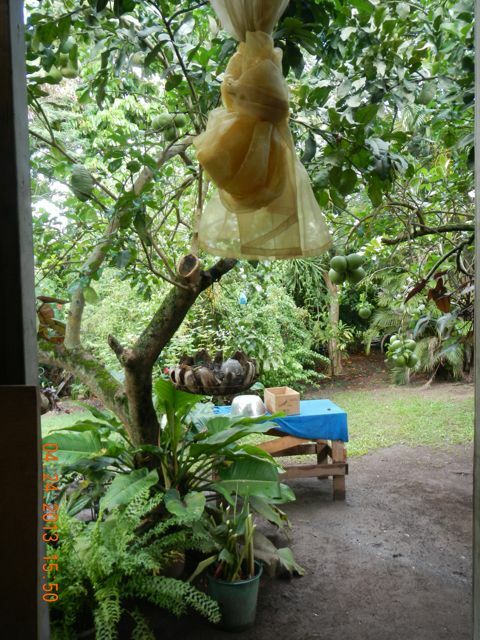 It's easy to live: just stroll out back and pick your meal from the ground since it's fallen from the tree. 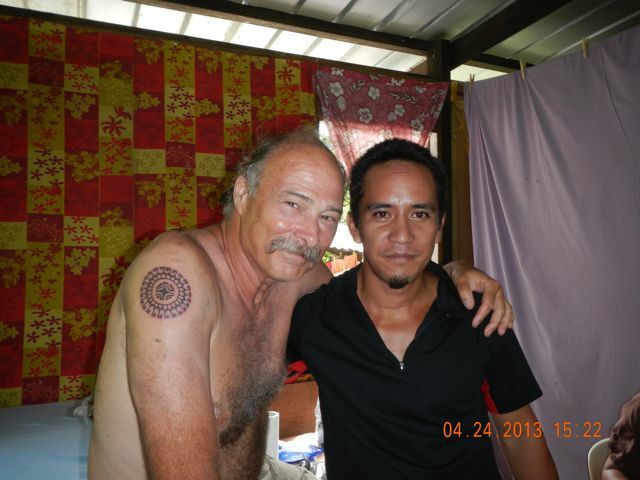 Tattoos were invented here in the Marquesas and the art is rebounding after many years of French repression. English and American whalers, landing on the islands, were intrigued with the art form and took the art on their skins back to their countries. As personal mementos and celebrations of our journey, Conni and I now wear traditional and original tattoo artwork. 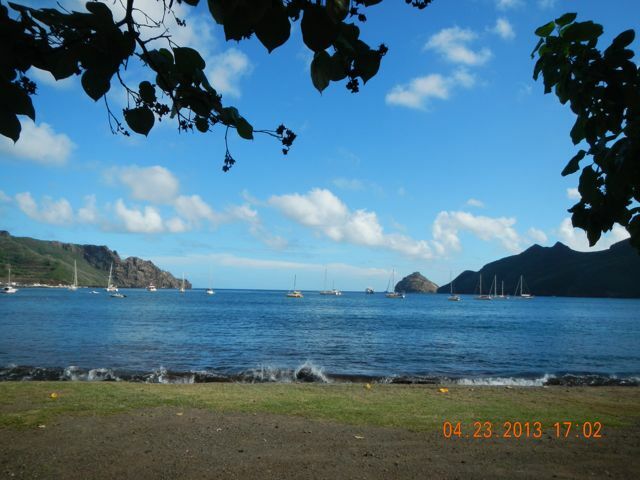 We awaken at anchor in the Taiohai Bay, Nuku Hiva. "Town" seen from the stern. 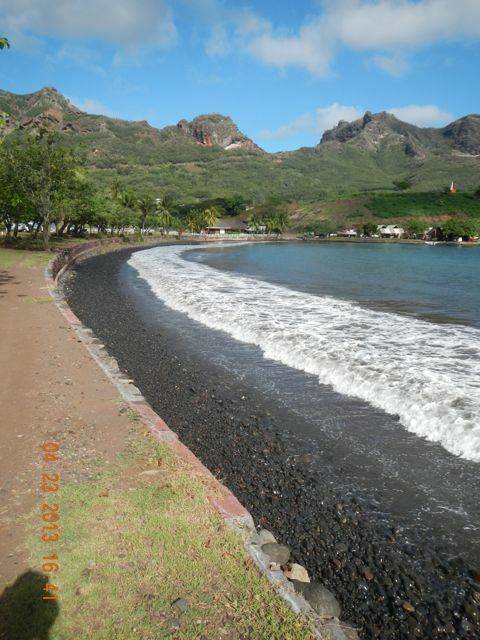 The lovely beach in Taiohae. The sand is ground basalt, so is black. The small cluster of boat services stands near the quay. 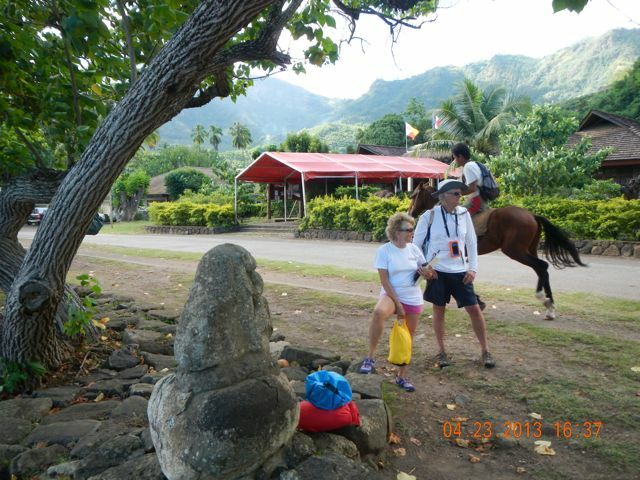 Conni and Chip watch as a local rider gallops by. The curve of beach along the sea wall of town. 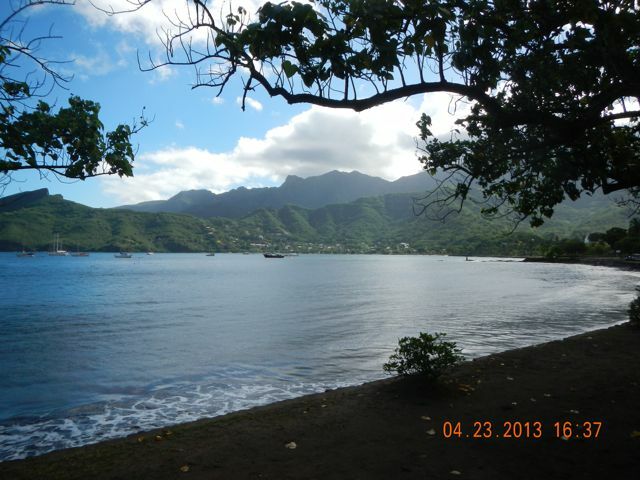 French Polynesian Francs must be purchased: 93 French Polynesian Francs to the American dollar! Leaving a 1000 FPF. tip took some getting used to! 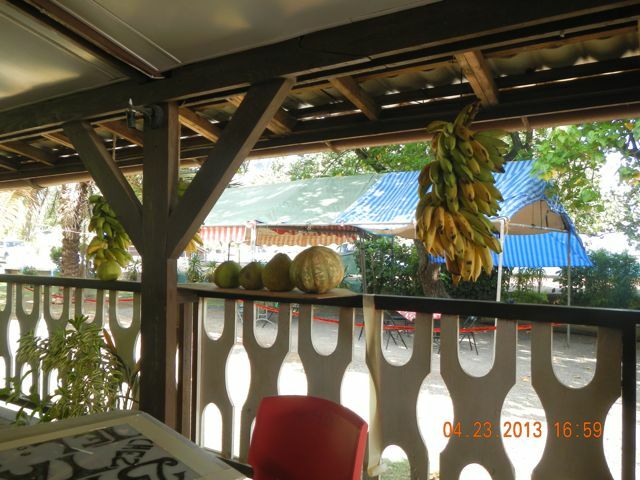 Our first restaurant meal, showing the hanging bananas. I strolled from the restaurant to snap this photo of the bay with the sailboats from all over the world. I If a boat is here, it traveled at least as far as we did. 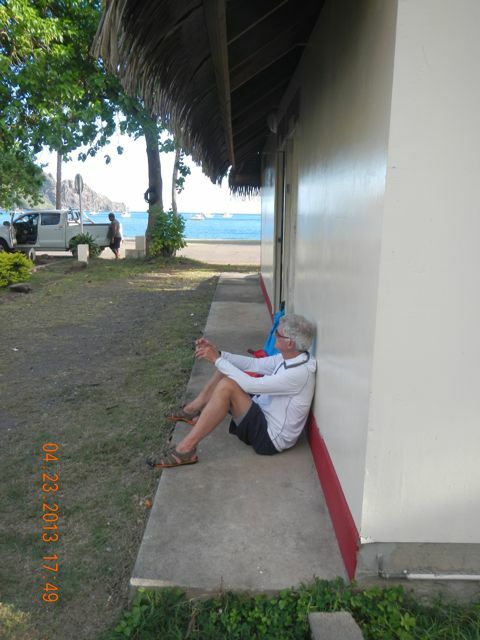 Chip and I await lunch, talking about the crossing. We arrived at 0230, dropped the hook, and enjoyed our champagne party until 0330, then slept until 0800. We were still exhausted. Chip awaits his turn in the cold water shower. My view as a received my tattoo. What a lovely view! 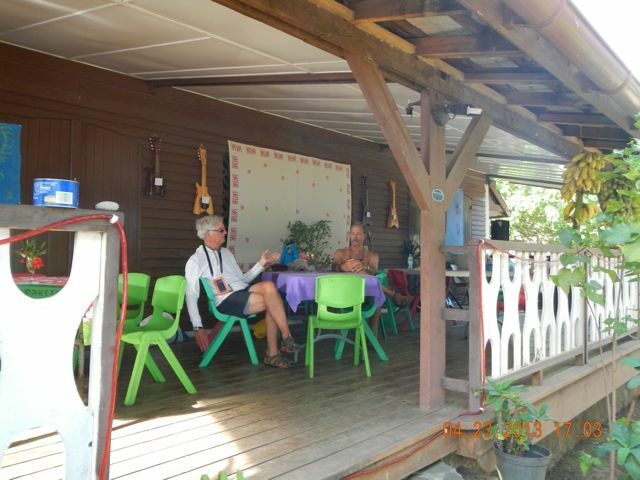 Francois' grandfather was a noted host at Daniel's Bay. 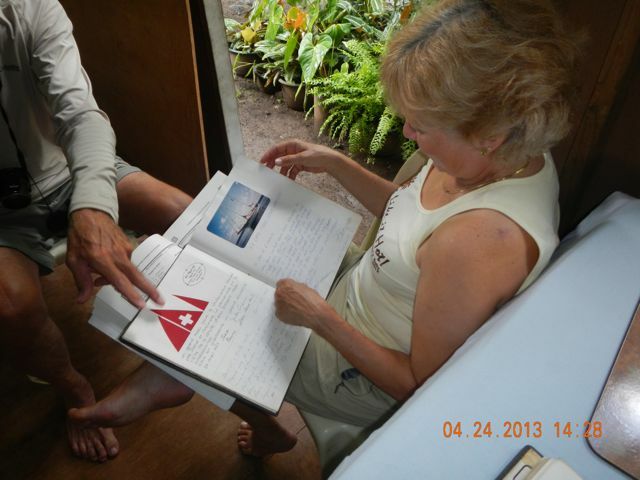 Francois showed us his grandfather's visitor's logs. 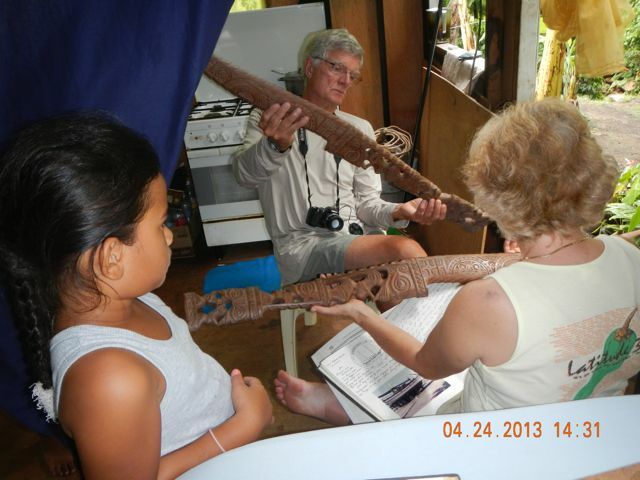 Chip and Conni hold a ceremonial sword made by grandfather Daniel. Francois and I celebrate the beautiful tattoo he designed for me. The outer ring is a "sea" motif of waves. the next ring is a "voyager" motif, and the inner symbol is the "Marquesan Cross". 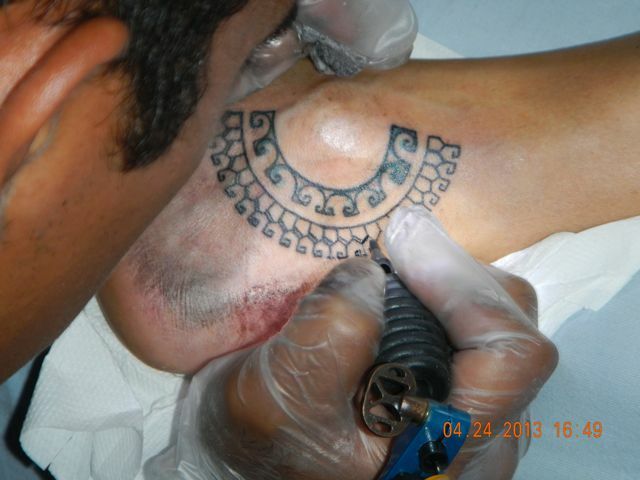 In a lyrical way, the tattoo said that I have voyaged the ocean to arrive in the Marquesas. Yep. 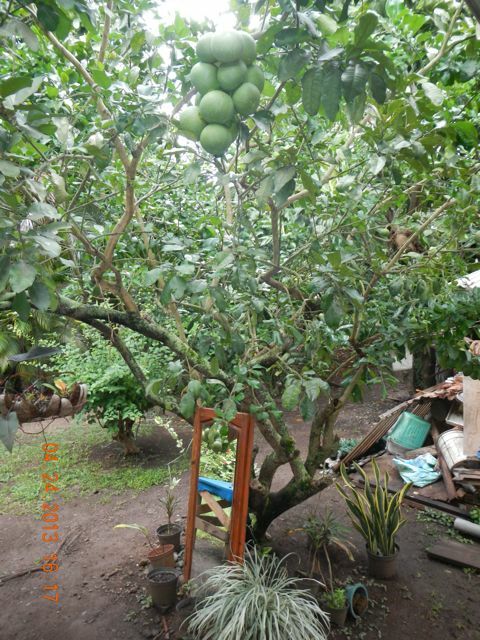 Francois' family garden and yard with its pamplemousse tree out back. 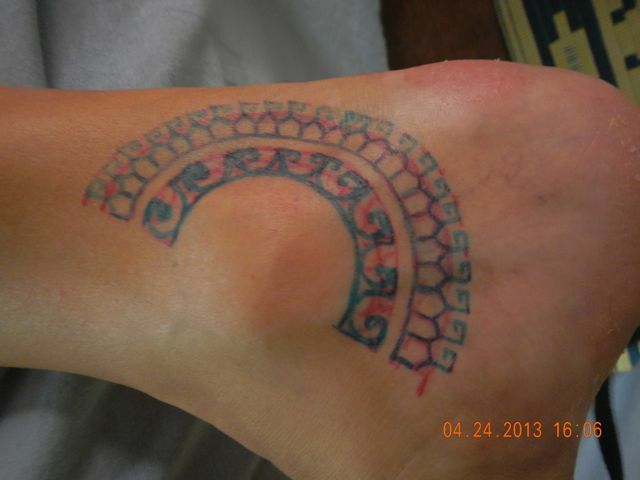 The design for Conni's tattoo surrounds her right ankle bone. 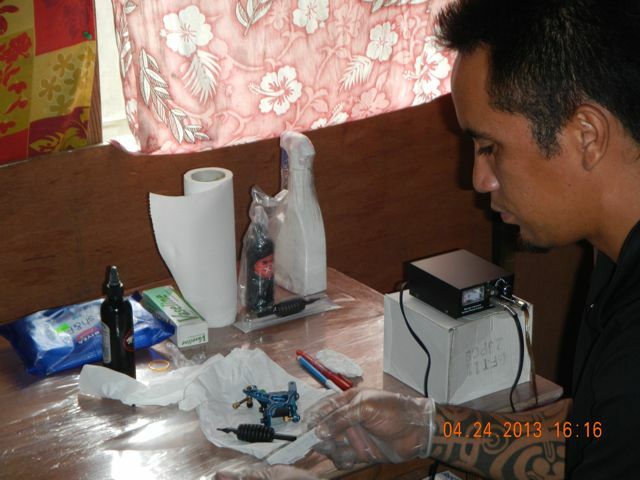 New tattoo equipment includes disposable needles, preventing infection. 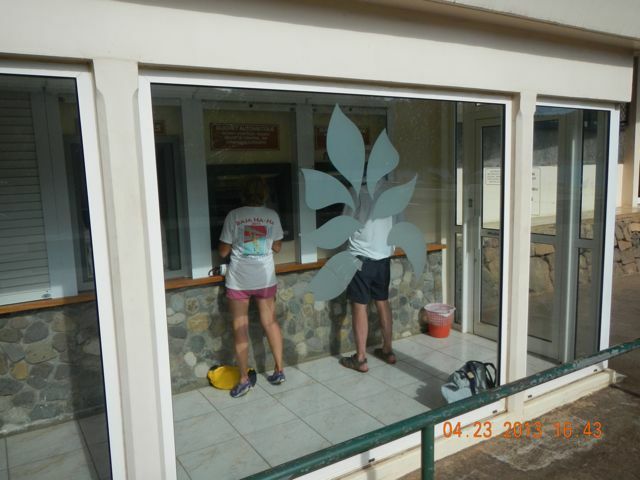 Francois is wearing gloves and has a very clean and careful worker. A mirror highlights the beautiful grounds of the family home. Francois works on Conni's tattoo. Her tattoo shows an inner arch of the wave/sea motif, an outer arch of smaller waves, and a middle arch of the "voyager" motif. Marquesan tattoos are the most beautiful I've ever seen. 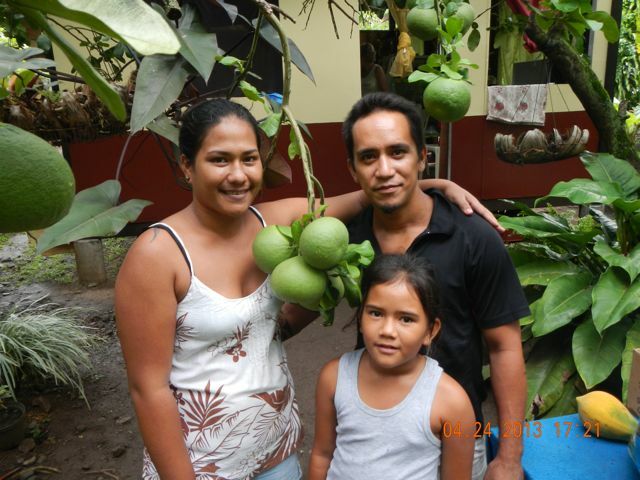 Francois and family gather around a pamplemousse. 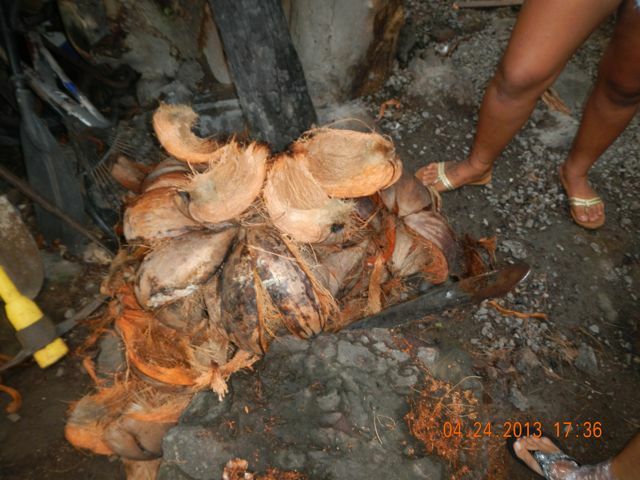 The stake at center is used to husk coconuts. 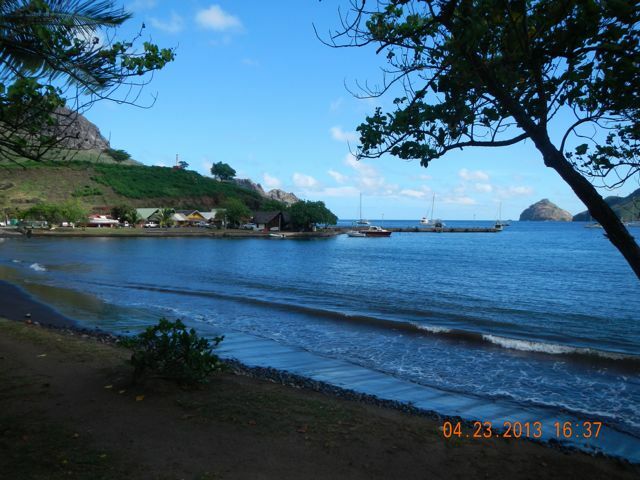 Nuku Hiva Yacht Services stands on the main quay in town. 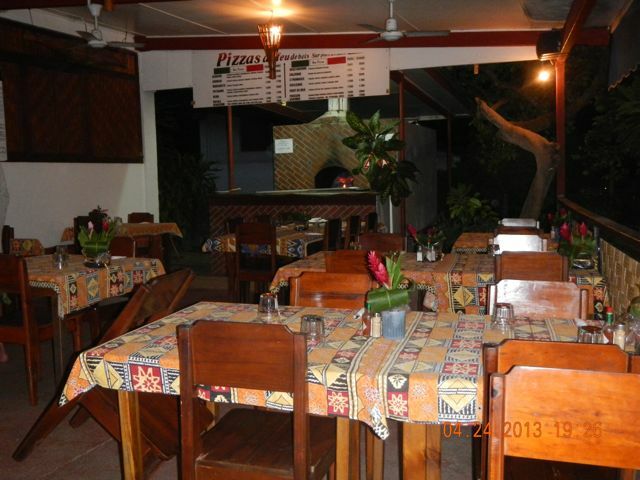 Moana Nui Restaurant is the best in town. 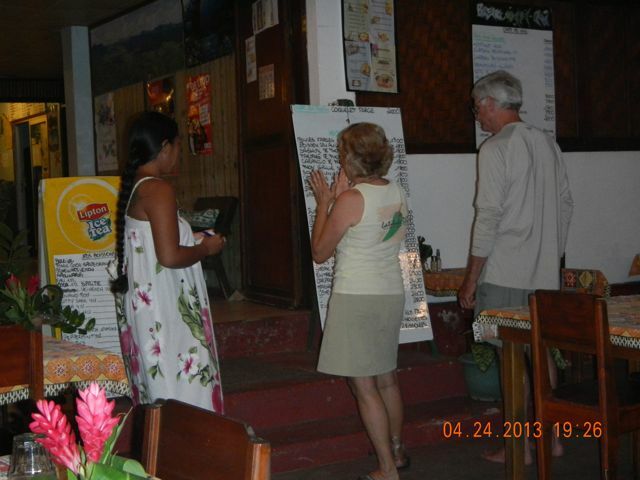 The menu is on the board and includes hand made, wood-fire-cooked pizza. The glow of the pizza oven shows at the oven door.